My older boys love superheroes. They dress up as superheroes, pretend to be superheroes, read about superheroes and examine carefully every picture about superheroes. Even the triplets aren’t opposed in indulging in a little bit of superhero fantasy. 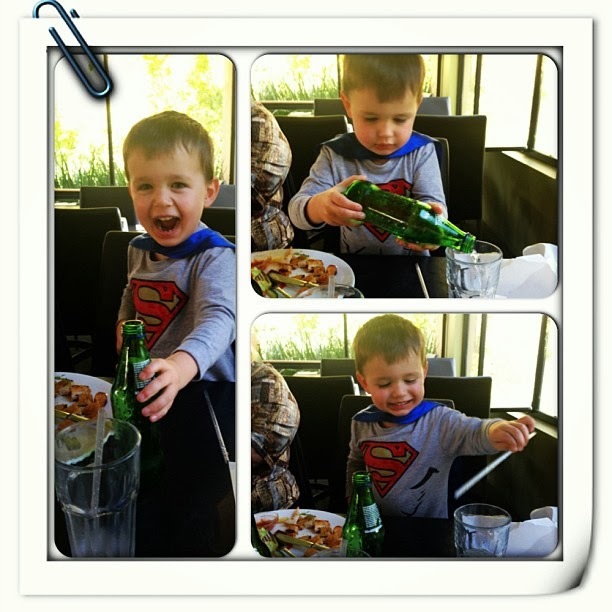 Three, almost four year old Trent, particularly loves superman. He loves playing superheroes with his brother and his little friends. Superhero in training. We will all be glad when super sulks or super tantrums are defeated. My children want to be superheroes when they grow up. So do I. In fact, I want them to be today. In fact tidying their room – a complete act of heroism in my opinion. Mother’s: do I hear an Amen? I’m not sure whether we are a super family sometimes, or just plain batty! Scholastic gave us a book by Claire Freedman and Sarah Mc Intyre which encourages this type of thinking. (Of course in a very fun way.) “Superkid” banishes bullies, eats broccoli and mushy peas, tidies rooms and sorts out pirates. Oh yeah. That’s my kind of kid! If you have superhero obsessed kids, I’ll give you some details, because if you are like me, you will be interested in a book that promotes heroism that begins with the simple details, but has captivating illustrations that capture a child’s imagination. So, with my hearty recommendation, this book is published by Scholastic UK, July 2013, RRP $15.99. 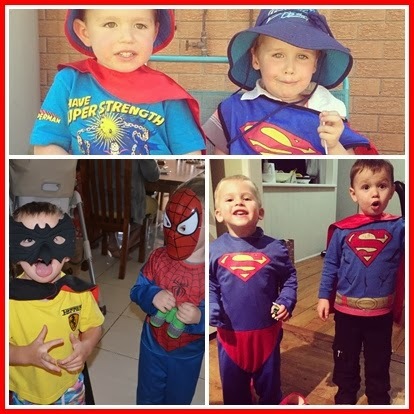 My boys say they want to be superheroes when they grow up. I want them to be superheroes today and every day of their lives. I want them to be young men now and later men, and a young lady who will develop into a woman who stands up for good and fights evil. I want them to speak on behalf of those who are oppressed. I want them to make a stand for injustice, even if it means personal discomfort. I want them to be strong individuals who stay calm in the face of adversity, not crumbling under pressure but fighting the good fight. I want them to be confident of their abilities and their natural talents and use their natural giftings to achieve these purposes. But, I want them to always know that they do not have superpowers. In fact, they need to recognise that by themselves they are quite weak. I want my children to be humble heroes who know that true strength and power come from being dependant on a higher power. But it is my prayer that they plug into that higher power – a supernatural power – because then there will be no stopping them. Amazing feats they can accomplish. Many lives can be saved. Evil will perish and good will triumph. Watch this space. These five little bodies can make a difference on this planet. Are you raising superheroes? Do you know of, or have kids who are obsessed with all things super? 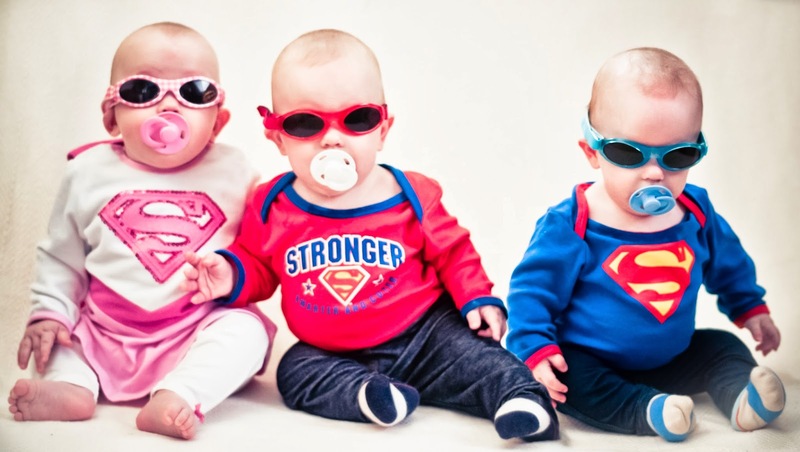 So love the photo of the super hero triplets with their dummies and sunglasses – classic! That is so true. Nothing like having a Daddy as a superhero to train the next generation! Absolutely! Superhero are a great platform for valuable life lessons on all types of issues. Oh yes, this is so true Julienne! Nothing like saving the damsel.